This entry was posted in concrete poetry, cultural identity, Holocaust, interview, poetry, Vispo, visual art and tagged Allamvedelmi Osztaly, Arrow Cross, Association of Hungarian Pioneers, Auschwitz, AVO, Budapest, Communist Hungary, Hungarian literature, Hungarian National Filmmaking Company, Hungarian poetry, Hungarian political refugees, Hungarian Revolution, Hungarian Secret Police, Hungarian Uprising, Ibi Gabori, Imre Madach, István Radó, Joseph Fusi, Luigi Pirandello, magyar irodalom, magyar költészet, Magyar Uttorok Szovetsege, Peter Pazmany University, political asylum, Regia Scuola Italiana, Robert Zend, Sandor Petofi, Siege of Budapest, Talpalatnyi fold, The Tragedy of Man, Tibor Kardos. Bookmark the permalink. 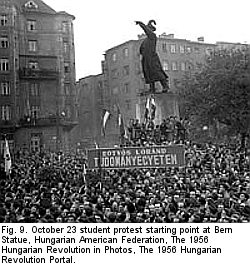 I would be interested to know the styles and groups of writers in Budapest at the time just before and after the 1956 revolution. Can we hear a bit about the literary conditions? Hi, James. I’ll be talking about Zend’s Hungarian literary roots in Part 5, including traditions of humour and the fantastical – sections on Imre Madach, Frigyes Karinthy, and the Budapest joke. Please stay tuned . . .